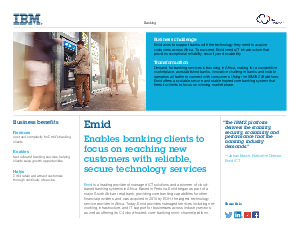 Emid is a leading provider of managed ICT solutions and a pioneer of cloudbased banking systems in Africa. Based in Pretoria, Emid began as part of a major South African retail bank, providing core banking capabilities for other financial providers, and was acquired in 2015 by EOH, the largest technology service provider in Africa. Today, Emid provides managed services including networking, infrastructure, and IT support for businesses across industry sectors, as well as offering its C4 cloud-hosted, core-banking omni-channel platform.